This oddity of a deal and one as far as I can tell, has no practical application is one I started performing by accident when practicing and figured I would include here for novelty. Due to the circumstances, I will make the explanations brief and simply leave you with the concept, if you are able to derive an application, then superb! The concept here is to use the same handling as a push-off second, but to push-off three cards instead of two. Doing so consistently requires some practice and isn't really my forte but works satisfactorily in the manners outlined earlier for second dealing. The take is the same as for double dealing, with one exception. You need some method of separating the top card from the other two, so you'll pull the top card back slightly then pinch the other two between your thumb and middle finger while performing the squaring mechanics. 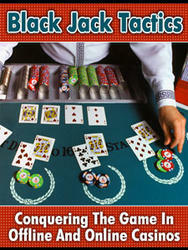 From this point it is simply a matter of a standard double deal handling in order to deal the cards to the table. A similar procedure is possible for the side strike deal where you lift three cards instead of two. 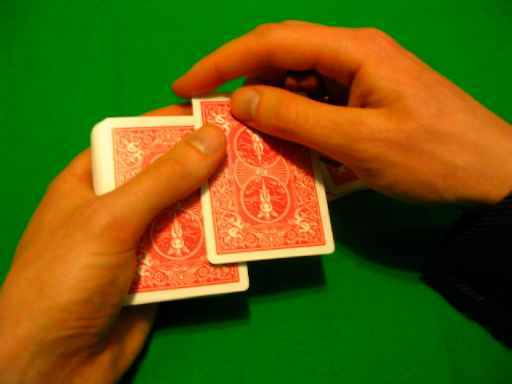 In order to separate the top card from the other two, apply forward pressure with your thumb against the forefinger slightly separating the top card, then continue with your take as usual. This process is not the most deceptive of all possibilities, but it is one of the most certain.